Pre-heat your oven to 350°F (325°F for dark or nonstick pans.) 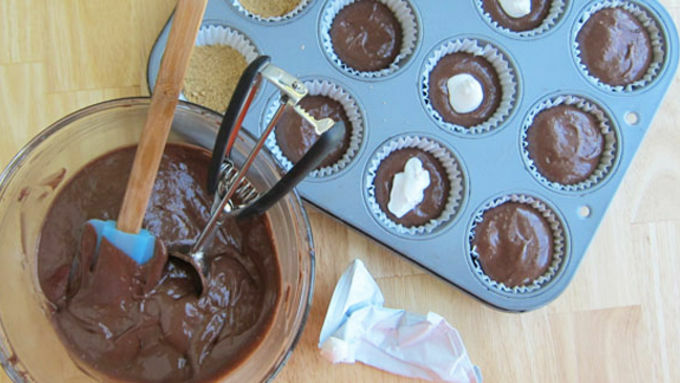 Fill cavities in cupcake pans with paper liners. Mix the graham cracker crumbs with melted butter. 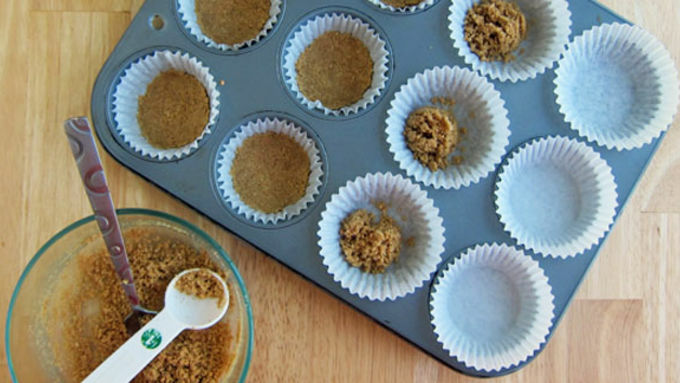 Fill each cupcake liner with 1 tablespoon of the crumbs. Use your fingers to compact the crumbs into a nice even layered crust. Beat cupcake mix, water, oil and eggs on low speed for 30 seconds then on medium speed for two minutes. Pour enough batter into each cupcake cup to cover the crust. Knead the marshmallow packet and snip off one tip. 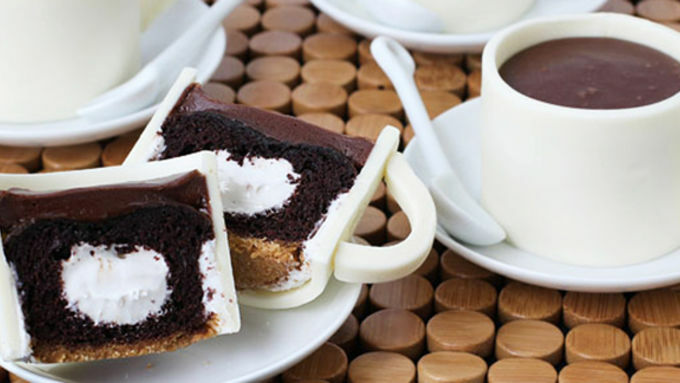 Squeeze some marshmallow into the center of each of the cupcakes. Pour the remaining cake batter into each of the cupcake liners. Bake for 24-29 minutes until the surface of each cake appears dry. Allow to cool completely. Unwrap the cupcakes and dispose of the paper liners. Frost the sides of each cupcake with Betty Crocker™ ready-to-spread vanilla frosting. Smooth out the frosting, making each cupcake into a cylinder. Dust work surface with corn starch or powdered sugar. Knead, then roll out fondant to about 1/8th of an inch thickness. Cut into 2 inch by 8 1/4 inch strips, re-rolling as needed. Wrap a strip around each cupcake. Cut off any excess fondant. Brush the edges where the fondant meets with water. Press together, holding until the edges stick together. 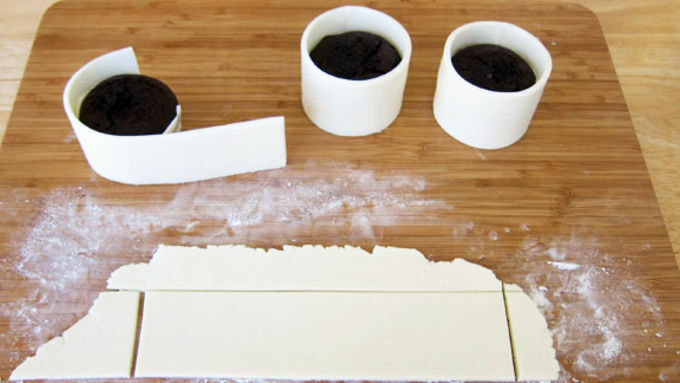 Roll the remaining fondant to 1/4 inch thickness. Cut into 2 1/2 inch by 3/8 inch strips. Bend into a curved coffee cup handle. Brush the ends lightly with water. Press handles onto the sides of each coffee cup. Use some rolled up paper towels to hold the handles in place until they dry. Scoop the smores frosting into a microwave safe bowl. Heat it for 20 seconds, then stir. If needed, heat for 10 second increments until the frosting is all melted. Pour a tablespoon of frosting over each cupcake being sure not to spill it on the fondant cups. Serve cupcakes on small saucers. 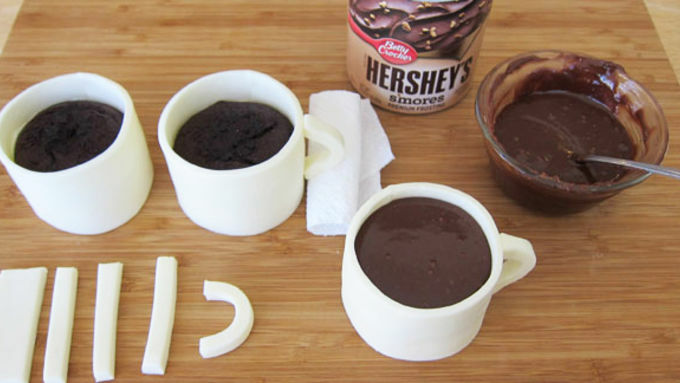 You can transform ordinary cupcakes into cups of coffee in a few simple steps. They look so real everyone will be surprised there is a luscious little cake inside! Each of these coffee cup cupcakes was made using Betty Crocker™'s new Hershey's S'mores Premium Cupcake Mix, and they are amazing. Each little cake has its own crumbly graham cracker crust and an ooey gooey marshmallow filling. When you bite into one, the flavors of a campfire s'more come bursting out. 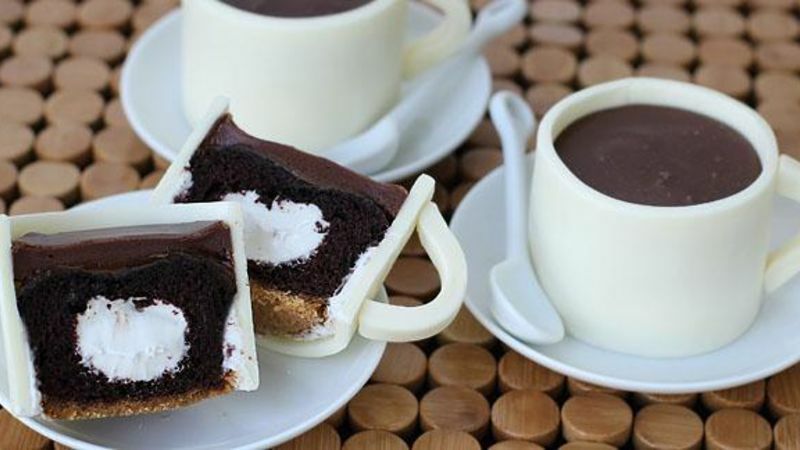 They were the perfect cupcake to use to make these coffee cups, because they look so cool when cut in half. All that marshmallow goodness peeking out from within the chocolate cake is a thing of beauty. Serve cupcakes on small saucers. 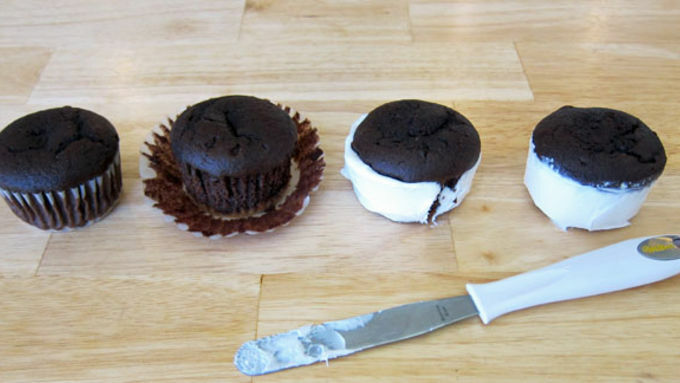 After serving, cut cupcakes in half to show the gooey marshmallow filling. Your guests will love the surprise!